Are you looking for the best cabinet range hood? Then you have come to the right place. That’s because we have prepared a list of the 5 best range hoods that you can go for. We have listed options for all types of budget range so that you don’t feel limited. Having said that, now let us check the different units listed. XtremeAir Ultra Series UL10-U30: If you want to have an under cabinet range hood with full power then this could be an ideal option for you. 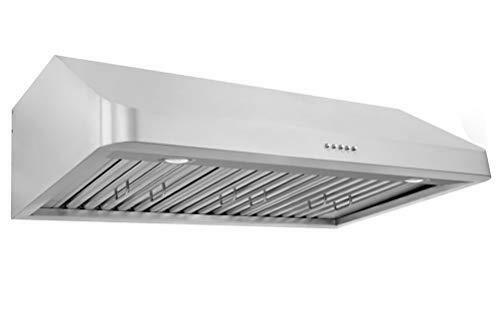 Made with stainless steel, this range hood comes packed with 900 CFM and can handle heavy odors and smoke. Cooks who have to deal with a lot of high heat searing and struggles with heavy smoke will definitely appreciate the extraction capabilities of this product. Not only that, but the product is also equipped with low and medium power fan settings which can benefit you even further. Even the fan noise is low that is nearly not noticeable. This particular unit is made in the USA and comes with a professional grade appearance. The fan motor comes with 10 years of warranty. The product is a bit on the expensive side but in comparison to its professional-grade power, it can be said that the price is justified. Cavaliere SV218B2-30 Wall Mount Range Hood: The next best cabinet range hood that you can go for is the Cavaliere SV218B2-30. This range hood doesn’t only look good but it also provides you with a high power fan operation. This range hood that is hard to beat because of all the features that it comes with. The best thing about the model is its sleek stainless design and simple design elements. Well, that is what makes it ideal for any type of kitchen. The powerful operation of the product is also something to look forward to. The product is equipped with a six-speed fan which is obviously more than any of its competitors. The airflow of the product is 900 CFM at top speed. This is in fact, one of the top capacity range hood that you will come across in the market. Other important features of the model include a timer function, reminder to clean the unit after every 30 hours and a 15-minute auto-shutoff option. The dual chamber motor of the unit is designed to reduce the noise of the fan. Even the keypad of the unit comes with capacitive touch. This may need a little bit of learning in the beginning but as you get used to it, it will get easier to operate the unit. Despite all these excellent features the unit has a mid-range price tag. Well, this is what makes the product more preferable to the buyers. 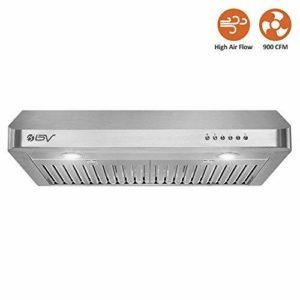 BV Stainless Steel High AirFlow Ducted Range Hood: This is yet another great model that you can go for when it comes to buying the best range hoods. 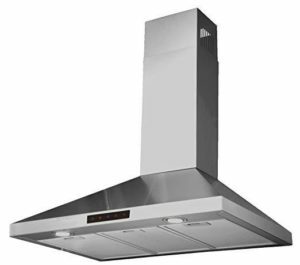 If you are looking for an efficient and powerful cabinet range hood then look no further as this can be the ideal option for you. The product comes with a unique slanted design and a high CFM. The product has the capability of circulating the air even with high heat or heavy smoke. Well, that speaks a lot about the efficiency of the product. The product is also equipped with dual motors. It also provides you with three fan speeds which come with push-button controls that make it easier for you to operate it. The slanted design of the model allows for a better flow of air over the entire cooking area. The product also has a removable oil filter which is easy to remove and clean. Overall, it can be said that this is a good and powerful range hood that you can go for. For cooks who are looking for a high CFM unit, this model will make a really good choice. Kitchen Bath Collection Kitchen Range Hood: For the ones who are in search of a wall-mounted kitchen range hood can easily go for this unit model. With high-end looks, ample power and convertible venting options this unit makes of the best choices of range hoods that you can go for. The unit is known to deliver airspeed of 400 CFM and also comes with a bright LED lighting that illuminates your cooking area. You can control the lighting function and the three-speed fan with a digital touchscreen. The best thing about this unit is its convertible design. This range hood is actually compatible with both a ductless and vented exhaust system. This spares you from the need of buying an additional installation kit. Also, the product is priced at a low rate. It can be said that the unit provides a good value to your money. 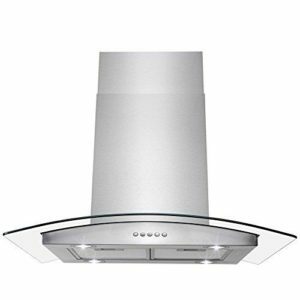 If you are looking for an efficient and sleek range hood then you can easily go for this model. 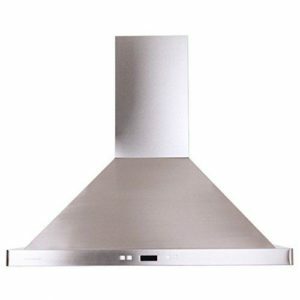 Golden Vantage Stainless Steel Euro-Style Range Hood: Last on the list we have the Euro Style Range. The product comes with a high-end look that goes well with any type of kitchen. The unit is known to provide you with 400 CFM which is fine for everyday cooking. The three fan speed of the unit can be controlled with push buttons. In comparison to the other models in our list, this can be a bit noisier. However, users still find the noise level to be tolerating enough. Overall, this is a decent range hood which is ideal for daily cooking tasks. If you are on a tight budget then this could serve as the best option for you. So these are the 5 best range hoods cabinet that you can go for. Now that you know about these models it will be easier for you to decide that which unit suits your needs the best. Based on your needs you can choose any of the mentioned models.